Herringswell is not a place you'd be likely to pass through. The village street runs off a quiet back road between the Cambridgeshire village of Kennett and the Suffolk village of Tuddenham St Mary. That is to say, of course, that it is not particularly on the way to anywhere. The village has that pleasing combination of large houses set back from the road and Victorian terraced cottages, all close together. 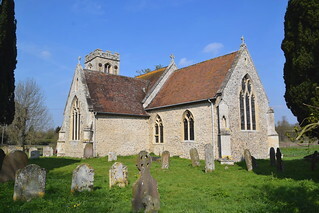 The church is in the village street, but there is a farmyard beside it and fields with horses beyond the churchyard wall. And yet, the church presents a very curious aspect to the street. For a start, there is an overwhelming south transept, and the tower has three massive buttresses, one in the middle of the west face, the other two forming stair turrets to north and south. These idiosyncrasies are a result of the church being largely rebuilt after being destroyed by fire in 1869, so that what you see today is almost entirely the 1870s work of our old friend Sir Arthur Blomfield. The other striking curiosity is the huge memorial outside the south porch. It remembers Herbert Davies, and he lies beneath a column being garlanded by what Sam Mortlock described as a lush young maiden. Davies was responsible for remarkable things, as we shall see inside. 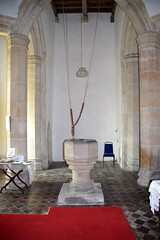 The tower is set within the body of the nave, for flying buttresses sprung from columns supporting it internally, creating an open space beneath it. Beyond, to the east, the rest of the church is similarly plain and uncluttered. This is a perfect foil for one of the best collections of Arts and Crafts glass in East Anglia. 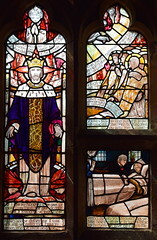 The story of the glass begins with two windows by Christopher Whall and two by his pupils, set here in 1902 as a memorial to Herbert Davies, who we have already met outside. 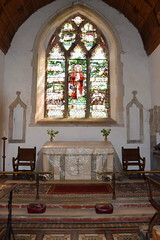 The biggest of these is Whall's east window, depicting Christ as the Good Shepherd. 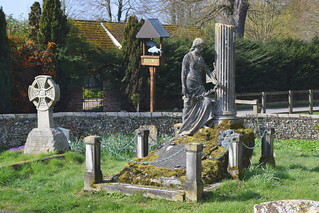 The central figure stands among groups of sheep, which Pevsner's revising editor James Bettley charmingly notes were drawn from the life from Davies's flocks by Whall's sister-in-law Alice Chaplin. The better of Whall's two 1902 windows depicts the Resurrection, an angel drawing away the stone and averting its eyes to avoid the power of the glorious light revealed. Whall's best window here is a memorial of the following year to Dr Walter Image, a relative of the stained glass artist Selwyn Image. 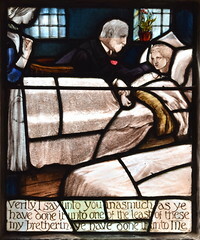 it depicts the good doctor treating a young patient, and then above taking his place among the choir eternal. 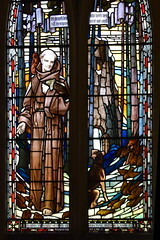 Of the other two 1902 windows in memory of Davies, one is by Jasper Brett, depicting Christ enjoining four figures to come unto me all ye that are weary. Indeed, everybody looks very sleepy. But the best of the four is by Paul Woodroffe, depicting for of such is the Kingdom, a glorious tangle of vines entwining the children being suffered to come unto Christ, one carrying a rag doll. Other later glass includes two grand nature scenes by James Clark with a hint of the Japanese about them. They depict the countryside around Herringswell in Spring and autumn, Suffolk forests and fields populated by rabbits and pheasants. Mortlock felt that they were intensely romantic concepts that skilfully avoid sentimentality, although I'm sure they would not be to everyone's taste. 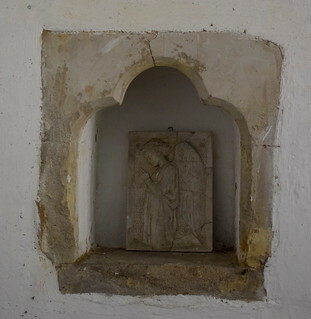 Clark's also is the rather alarming St Francis in the north-west corner of the nave. Two later windows have been added to this Arts and Crafts firmament, although, as James Bettley politely notes, they struggle to continue the pictorial tradition. 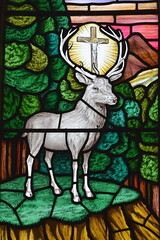 The most striking, even garish, is Herbert Luxford's 1954 window depicting St Hubert, the hunter who allows a stag to live and then sees the light of a crucifix shining between its antlers. The dog seated at the saint's feet is memorable. 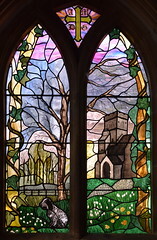 The most recent window is Cambridge Stained Glass's 1992 depiction of nature springing to life around Herringswell church, politely tucked away around the corner in the transept. 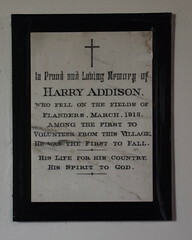 The jewel-like simplicity of the nave is a lovely setting for two World War One memorials, one to Harry Addison who fell on the Fields of Flanders, adding that among the first to volunteer from this village, he was the first to fall. 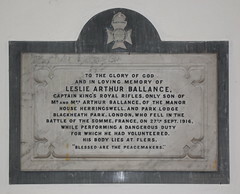 The other remembers Leslie Ballance, killed in the Battle of the Somme Performing a dangerous duty for which he had volunteered. 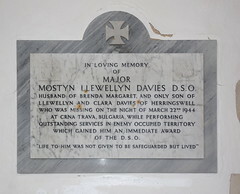 A memorial from the next war remembers Mostyn Davies, who died while performing outstanding services in enemy occupied territory. I do wonder if it is necessary to keep this church locked. For sure, there are three friendly keyholders nearby, but there is nothing whatsoever of value in this church except the glass in the windows. Nobody is going to steal anything from here. 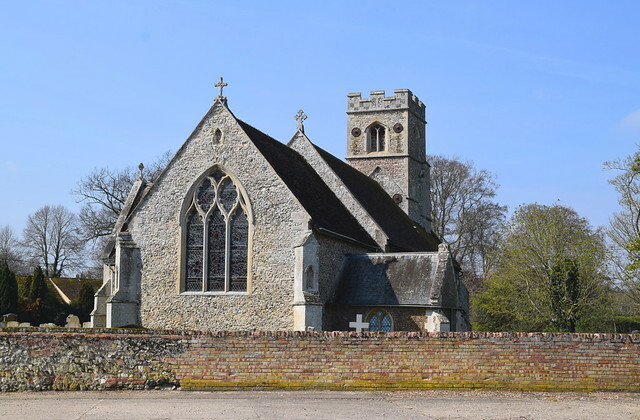 The national organisation Churchwatch tells us that a church which is kept locked all the time is far more likely to be vandalised than one which is opened daily. Locking churches protects nothing, all it does is make us complacent. 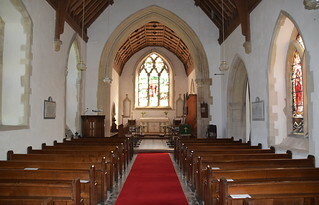 If I was a churchwarden here I would consider wedging the main door open in daylight hours, and encouraging as many visitors as possible.